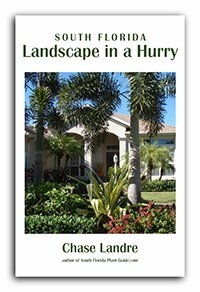 Nothing says South Florida living like orange bird of paradise, a nature's work of art with exquisite flowers shaped like a bird in flight - or a crested bird's head on long stems resembling the graceful neck of a crane. If ever a single plant could symbolize our exotic, sub-tropical locale, it would be this one. 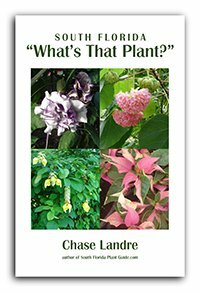 That's why we've chosen it as the featured plant in our header here at South-Florida-Plant-Guide.com. 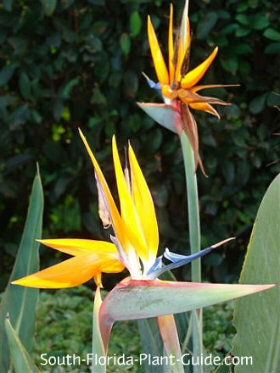 Orange bird of paradise grows in a clumping form with thick, gray-green leaves on graceful, upright stems. It makes an outstanding tropical accent, working well in formal landscapes or more casual designs. This showy plant should be used as a focal point in the landscape, where it can show off its unusual form and beauty. 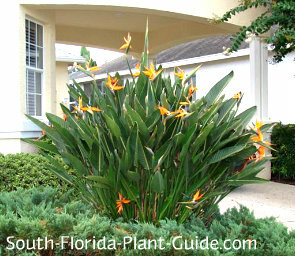 Its overall mature height fits any size yard (the white bird of paradise is much larger, growing to 25 feet) and the flowers appear on and off all year, more during warm months. Orange bird of paradise will grow in full sun but seems happiest in part sun or part shade. The plants do best in Zone 10, but can be container-grown in Zone 9B and moved indoors when cold snaps hit. They're slow growers to about 4 to 6 feet tall and wide, and are considered deer-resistant (though we make no promises). Orange bird of paradise can sit there and look pretty - but not bloom. If yours has been in the ground awhile and seems reluctant to blossom, start a regimen of fertilization. Once consistent blooming begins, let the plant go extra dry between waterings and it will flower more. You can also add composted cow manure to enrich the soil around the plant's roots. No trimming is necessary other than to remove any browned leaves and stems. These plants are drought-tolerant, but do best with regular irrigation and enough time between waterings for it to dry out. Never place a bird of paradise in an area that doesn't drain well, and for shadier locations that hold moisture longer, check the soil before watering to get your irrigation timed just right. Orange birds are heavy feeders, so begin fertilizing a month after planting. Apply a good granular fertilizer in spring, summer and autumn, supplemented with bone meal and liquid fertilizer for best results. Avoid mulching right up to the plant (this goes for any plant, for that matter) to avoid stem rot. Place these plants at least 3 feet apart - give it enough room to fan out as it matures. The flowers tend to appear more on outer stems, so don't overcrowd it with other shrubs. If placing by a walk or drive, come in about 4 or 5 feet. These "birds" make excellent container plants. COMPANION PLANT SUGGESTIONS: Pair with low growers that don't require a lot of water and will let the orange bird be the star of the show. 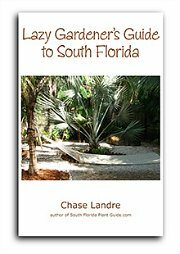 Depending on the location's sunlight, consider juniper, Asiatic jasmine (jasmine minima), bromeliads, peperomia, mondo grass, dwarf clusia and carissa.